I like to keep abreast of all the new resistant starch studies that come out, and I’ve been getting flooded with emails about this one: Resistant starch and arabinoxylan augment SCFA absorption, but affect postprandial glucose and insulin responses differently. Link above is to the abstract, but here is the full-text if you’d like to see. 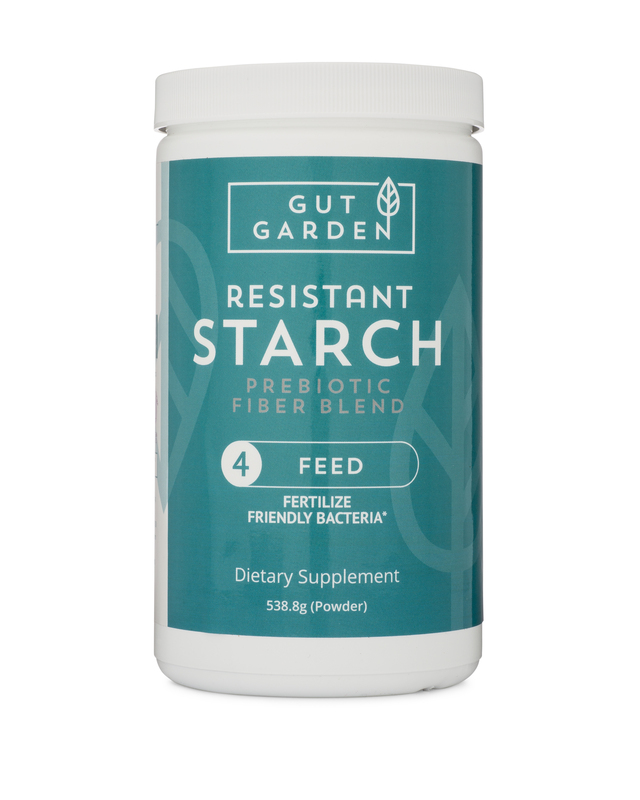 Apparently the word is out that resistant starch, especially RS2, and especially that from raw potatoes “raises insulin.” But what does that mean and what other terrible things does potato starch do? First, let’s look at the study and what it set out to prove. Six pigs were surgically outfitted with multiple collection tubes to sample gut contents and blood in different parts of their body, I hate to think of what this experiment looked like, but science is sometimes ugly. I like pig studies because they are omnivores with a gut similar to humans and they seem to react similarly to humans in diet studies. It would have been better to perform this study on humans, but I doubt there would be many volunteers, especially when they read the part in their contract about sample collection! But this was carefully controlled to minimize pain and suffering. The animal experiments were conducted according to the protocols approved by the Danish Animal Experiments Inspectorate, and were in compliance with the guidelines of the Ministry of Food, Agriculture and Fisheries concerning animal experiments and care of animals under study. The health of the animals was monitored throughout the experimental period, and no serious illness was observed. The diets used were well designed. The “Western Diet” was wheat and fat heavy, the “RS Diet” used potato starch and corn starch (HAMS), and the “Arabinoxylan Diet” used a special type of manufactured wheat fiber, similar to manufactured fiber supplements that are found in Fiber One cereal. And, no, I do NOT recommend Fiber One cereal! The overall fiber on the Western diet was lowest, and the high fiber diets provided equal amounts of fiber, but way more than any human would probably ever eat (113g raw starch or 11 TBS). But, no matter, these are pigs that normally eat lots of fiber. I loved that they used a well-balanced meal plan, not just isolated starches. The pigs were allowed to adjust to their new ‘hardware’ for a week, then fed one of the diets for 7 days. The researchers wanted to compare the metabolic changes between the three diets. They found some interesting things. Throughout the experiment, the pigs had their blood and waste streams monitored for numerous biological markers such as glucose, insulin, short chain fatty acids, etc… Thanks to all the hoses and probes, the researchers were able to sample blood in several locations, the portal vein, mesenteric artery, and the hepatic vein. Yeah, I know…don’t worry, just realize these pigs were well suited for thorough testing! The short-chain fatty acids (SCFA) produced by the different diets was as to be expected. The Western Diet produced the smallest amount of healthy SCFA, the RS and wheat fiber diets considerably higher. This is an indication that the potato starch, corn starch, and wheat bran were being fermented by gut microbes. 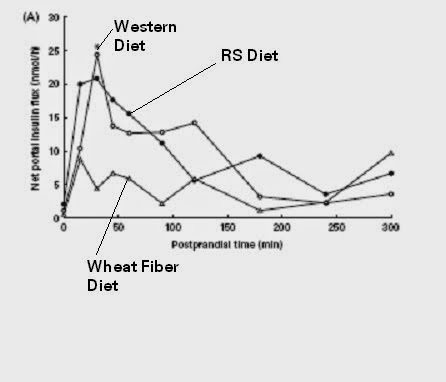 The higher level of [dietary fiber] in the RS Diet and [Wheat Fiber Diet] increased colonic fermentation significantly, but to a different extent compared with the [Western Style Diet]. 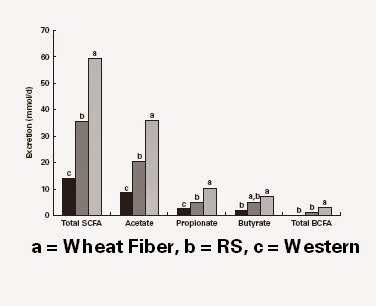 The consequence of this difference was higher SCFA absorption in pigs consuming the [Wheat Fiber}rich diet than those fed the RS-rich diet, suggesting that in the present study, the [Wheat Fiber] was a more effective stimulator of colonic fermentation than the RSD. The high butyrate production with the [Wheat Fiber] is most probably caused by the high dietary content of [Arabinoxylans] and fructans. 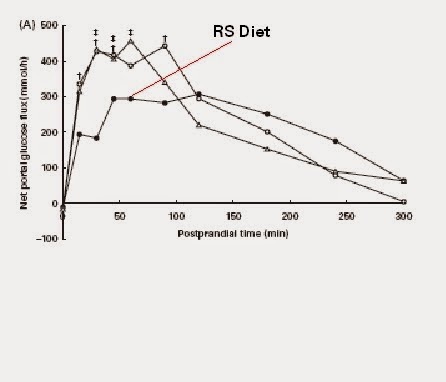 The intermediate levels observed in response to RS Diet feeding was, however, unexpected, since previous in vitro studies and in vivo studies on pigs and human subjects have indicated that RS is a more butyrogenic substrate than other NSP [(fiber types)]. 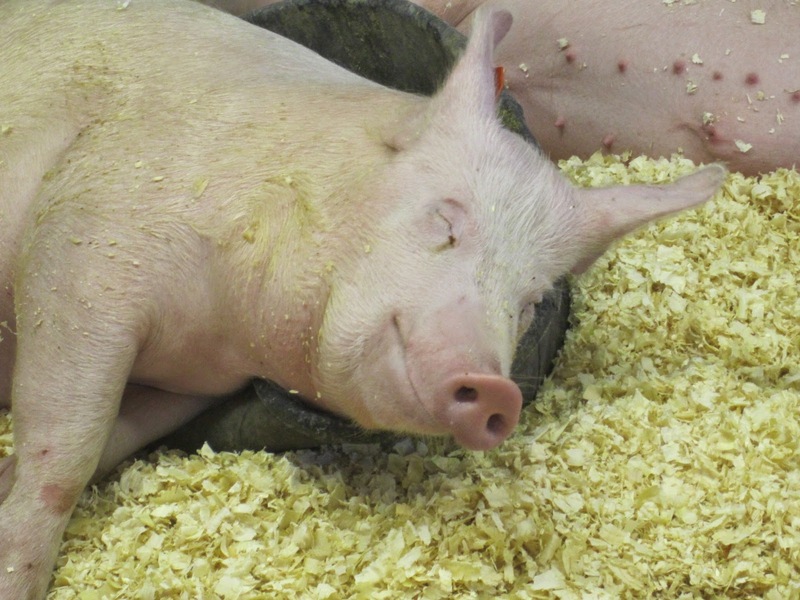 However, the increased faecal bulk and SCFA excretion in [Wheat bran]-fed pigs compared with those consuming the RS Diet corroborate the observation that in the present study, the [Wheat Bran Diet] was more fermentable and more butyrogenic than the RS Diet. Clearly something is going on with the Wheat Fiber group! So, maybe these Arabinoxylans are worth looking into! 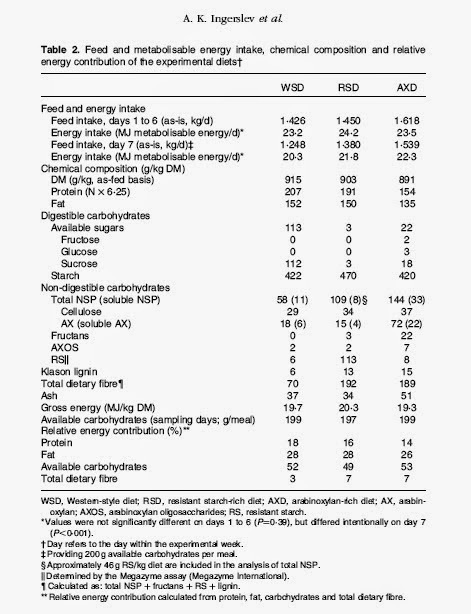 But notice that RS did a respectable job of increasing SCFA compared to the lower fiber diet. Next we need to look at the insulin raising qualities of RS. Is this a concern? Afterall, the title of the paper is: “Resistant starch and arabinoxylan augment SCFA absorption, but affect postprandial glucose and insulin responses differently” Sounds ominous to me! This chart represents the insulin seen in the portal vein. If ‘lower is better’ than you can see that the RS Diet does a pretty good job. Especially when you go out to the 120 minute point, where it outperforms the other two very handily. But this is not a race, it’s a study. The Wheat Fiber Diet does seem to have some distinct advantages in keeping insulin low in the first two hours after eating, but then there’s a very noticeable hump at the 200 minute mark. So there we have it folks! There were some differences in the way wheat fiber and RS2 effected insulin, glucose, and even SCFA. But no doubt about it, a diet filled with fiber trumps a low fiber diet. If anyone tries to tell you there’s a new pig study that shows raw potato starch “raises insulin” you can now point them here and show them the facts. If you want some arabinoxylans (AX), there are much better sources than wheat fiber as used in this study and in Fiber One cereal. It can even be purchased on Amazon, but quite expensive! Nearly all grain has AX in it’s outer cell walls. This is the beauty of “whole grains” we always heard about, but quickly forgot when we “went Paleo.” Dr. Davis, author of Wheat Belly, has seen the light and now recommends people who give up wheat should eat a raw potato daily for fermentable fiber. 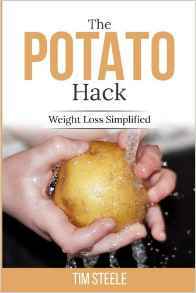 While a raw potato is not a bad idea, and in fact, may be an excellent idea, if you aren’t into that scene, then consider eating some gluten-free whole-grains. Corn, quinoa, buckwheat, teff, and rice all contain AX. These make exceptional side-dishes and also contain RS and other fibers. It’s a shame that so many people were goaded into completely foregoing grains when they are one of the best fiber sources you could ever find. Lots of papers on AX. Read here, here, and here if you want to learn more. If you are using raw starches as a fermentable fiber supplement, please take note of this study. The wheat fiber did show some unexpected benefits over the potato and corn starches. So, as I’ve always said, get a good mix of fiber types and don’t rely on potato starch to meet all of your fiber needs. Eat plenty of real foods. Try to get 20-40 grams of fiber daily from a wide variety of foods. On days you don’t get much fiber, supplement with one of the raw starches we’ve talked about around here like potato starch or Hi-Maize, or some other fiber supplements like inulin, glucomannan, or green bananas or heck, even a raw potato. Consider putting grains back into your diet as well.